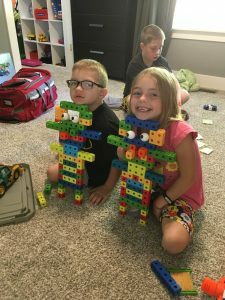 Quick July 2018 Update - Adventures with the Tuleys! All in all, things have been great! 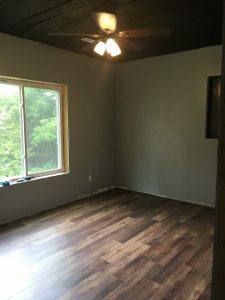 We’ve been working slowly on getting our house finished. Nathan worked super hard in April and May to get things done for our final appraisal. 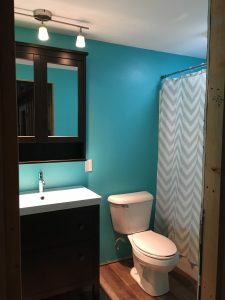 Afterward, our attention turned to finishing a guest room and bathroom in the basement. Nathan’s intern and wife have been staying with us this summer and are the first to use the rooms! They’ve been great to have and we’re sad they only have two more weeks with us. They’ve been a joy to get to know and the kids have really had a blast with them here. 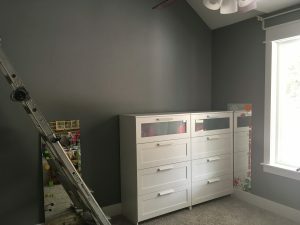 In order to get moved into our house quicker, we just chose a simple grey paint and painted all the rooms the same color. 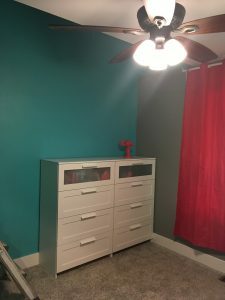 I told the kids we could update the colors in their rooms at some point. 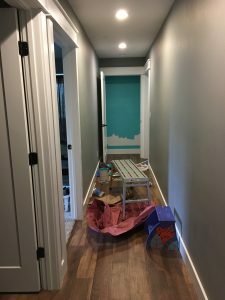 When we were painting the basement rooms, I picked a color the girls wanted in their room also. 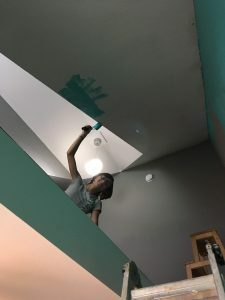 Tuesday, Grace and I worked on painting two walls and the loft ceiling section blue. It’s fun to have some color! We had some paint left, and since the hall closet was white and already starting to show some wear, I painted it real quick also! 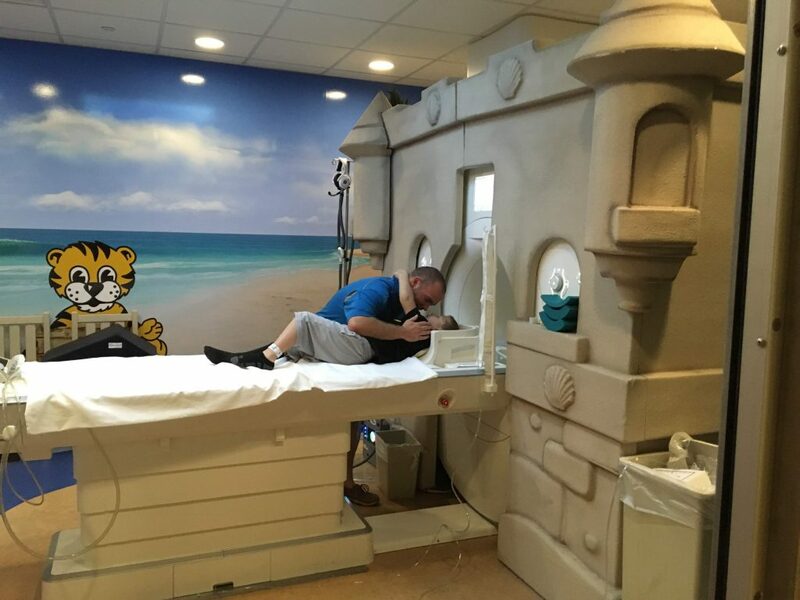 I realized I never updated the blog to say Josiah’s May 23 MRI looked great! Since he’s no longer sedated for the MRI, we just made it a family day and brought all the kids with us. He really enjoyed having his siblings with him and did great with getting the IV put in. 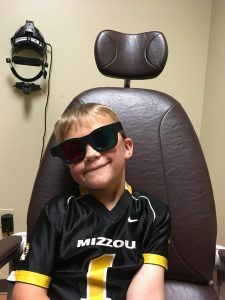 He enjoyed getting to watch the movie during the MRI with goggles – and he really enjoyed getting to see the goggles show up on the MRI pictures! 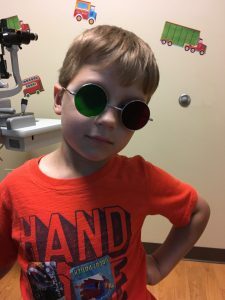 His eyes were checked earlier in May, and his prescription had updated, so we were able to go pick up his new glasses after his MRI. When we got home after the MRI and appointments, we worked on getting packed for our weeks in Dallas. We left the next morning on May 24th and got home on June 2nd. It was a great few weeks spending time with our PBT family! Be sure to check out our most recent newsletter with more information and pictures if you haven’t had a chance to read it yet! Josiah started therapy (OT and PT) again for the summer and has really enjoyed being back up there. We’re looking forward to intensive therapy again in the fall. He’s had a few appointments that have gone well, most of them just regular check-ups. This morning, he will get fitted for a new leg brace, and possibly some for his elbow and wrist. He grows out of them so fast! We’ll also get the results from his neuro-psychology testing, which I’ll explain more about at that time.